Concert "SURYA PURVI” - dedication to the Sunset " by Subshri Janardan - is going to be a remarkable and unique event in Moscow cultural life. The idea of the program belongs to Mrs. Subshri Janardan. Subshri Janardan is the first Russian professional performer on the sitar and surbahar (in the tradition of Imdad Khan gharana), who had received international recognition. Equally, she is known as a vocalist of Delhi gharana (“Hindustani” or North Indian style of singing).Due to her unique musical talents, hard work and dedication, Subshri Janardan was awarded a scholarship by the Indian Council for Cultural Relations, Government of India and was admitted in Gandharva Mahavidyalaya Institute, New Delhi - one of the leading art institute in India. She became a student of two departments - the North Indian classical vocal and sitar. Subshri Janardan has started giving sitar and vocal recitals when she was a student. She successfully continued her concert career after the completion of her studies. She has performed in many prestigious venues in India, Russia, Latvia, Ukraine, Estonia, Great Britain, Sri Lanka and China, participated in major festivals, including the Edinburgh International Festival "Fringe", festival in Varanasi "Shankar." Subshri’s performances have been warmly received by audience and critics not only because of her filigree technique of playing and singing, her deep emotional involvement, spirituality generated images, but also because of a unique combination of sitar and surbahar music as well as Hindustani vocal in one concert. Subshri Janardan resides in India( New Delhi) and besides of her successful performer’s career, she is also well known as a teacher. She regularly delivers master classes on sitar and classical Indian vocal in Moscow State Conservatory and Indian Cultural Center, Embassy of India, Moscow.Subshri Janardan performs both concerts of classical format as well as innovative productions like concert "Surya Lalit" (2012). This year Subshri is going to perform a new project - “SURYA PURVI – dedication to the Sunset”, that is a unique. It is the result of creative research carried out by Subshri. For several years she studied the ancient Indian texts of the Vedas and Puranas, which describe the worship the Sun God or Surya. At the beginning of the program, using the ancient texts from the Yajurveda, Subshri introduces audience to the sacred practice of greeting the Sun. In sanskrit language she will sing mantras of welcoming and worshiping the solar deity. It will be accompanied with distinctive hand movements, which are also described in the Vedas and Puranas. To help audience to understand what is happening on stage better, Subshri will give a detailed explanation of the mantras and hand gestures. Subshri will perform such ancient mantras like a mantra of awakening and purifying of 12 energies( in shaivas tradition) and 24 energies( in vaishnav tradition), Ganesh mantra ( in shaivas tradition), well known “Gayatri Mantra”, mantras for greeting the deities of the world, mantra-glorification of the Great Sun God “Surya Narayana”. A special slide show and lighting will help viewers to deeply experience the mystery of the Vedic worship of the Sun. In second part Subshri Janardan will perform raga "PURVI” on surbahar which is considered as one of the most mysterious among Indian instruments. Surbahar - a string instrument with a deep and low pitch voice. It resembles sitar - a well-known instrument outside India, but surpasses it in size. It is interesting to note that only 3 women in the world play surbahar in the concerts and Subshri Janardan is one of them. In the concluding part of the concert Subshri will present a vocal raga "PURVI" which will be performed in the tradition of well-known Delhi schools of singing.Speaking about the outstanding features of the program-dedication to the Sun, it is necessary to note, that all music from first to last note that Subshri Janardan, strictly following the canons of Indian classical music, had composed for this project, was written in one raga “ PURVI”, which means "dedication to the sunset." Concert "Surya Lalit - dedication to the Sun" by Subshri Janardan - is going to be a remarkable and unique event in Moscow cultural life. The idea of the program belongs to Mrs. Subshri Janardan. Subshri Janardan is the first Russian professional performer on the sitar and surbahar (in the tradition of Imdad Khan gharana), who had received international recognition. Equally, she is known as a vocalist of Delhi gharana (“Hindustani” or North Indian style of singing). Due to her unique musical talents, hard work and dedication, Subshri Janardan was awarded a scholarship by the Indian Council for Cultural Relations, Government of India and was admitted in Gandharva Mahavidyalaya, New Delhi - one of the leading art institute in India. She became a student of two departments - the North Indian classical vocal and sitar. Subshri Janardan has started giving sitar and vocal recitals when she was a student. She successfully continued her concert career after the completion of her studies. She has performed on many prestigious venues in India, Russia, Latvia, Ukraine, Estonia, Great Britain, participated in major festivals, including the Edinburgh International Festival "Fringe", festival in Varanasi "Shankar." 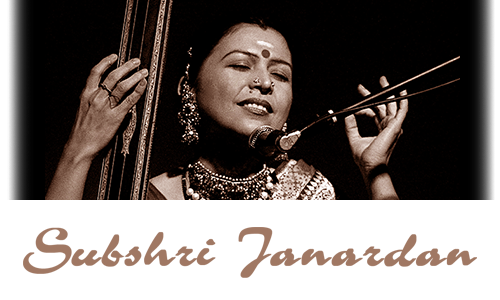 Subshri’s performances have been warmly received by audience and critics not only because of her filigree technique of playing and singing, her deep emotional involvement, spirituality generated images, but also because of a unique combination of sitar music and Hindustani vocal in one concert. Subshri Janardan resides in India and besides of her successful performer’s career, she is also well known as a teacher. She regularly delivers master classes on sitar and classical Indian vocal in Moscow State Conservatory and Indian Cultural Center, Embassy of India, Moscow. Subshri Janardan performs both concerts of classical format as well as innovative productions like concert "Surya Lalit." Concert-dedication to the Sun – is a unique project. It is the result of creative research carried out by Subshri. For several years she studied the ancient Indian texts of the Vedas and Puranas, which describe the worship the Sun God or Surya. At the beginning of the program, using the ancient texts from the Yajurveda, Subshri introduces audience to the sacred practice of greeting the Sun. In sanskrit language she will sing mantras of welcoming and worshiping the solar deity. It will be accompanied with distinctive hand movements, which are also described in the Vedas. To help audience to understand what is happening on stage better, Subshri will give a detailed explanation of the mantras and hand gestures. Subshri will perform such ancient mantras, like a mantra of awakening and purifying of 24 energies, well known “Gayatri Mantra”, mantras for greeting the deities of the world, mantra-glorification of the Great Sun God “Surya Narayana”. A special slide show and lighting will help viewers to deeply experience the mystery of the Vedic worship of the Sun. In second part Subshri Janardan will perform raga "Lalit" on surbahar which is considered as one of the most mysterious among Indian instruments. Surbahar - a string instrument with a deep and low pitch voice. It resembles sitar - a well-known instrument outside India, but surpasses it in size. It is interesting to note that only 3 women in the world play surbahar in the concerts and Subshri Janardan is one of them. In the concluding part of the concert Subshri will present a vocal raga "Lalit," which will be performed in the tradition of well-known Delhi schools of singing. Speaking about the outstanding features of the program-dedication to the Sun, it is necessary to note, that all music from first to last note that Subshri Janardan, strictly following the canons of Indian classical music, had composed for this project, was written in one raga 'Lalit', which means "solar."